In no way have I mastered the art of making shapeless clothing out of knit fabric, but I’ve really been wanting to move on and conquer my fear of darts and zippers. Lately I’ve been pulling out some fitted patterns to attempt. Last weekend I began building what has potential to be a lovely summer dress, which I’ll have to rush to finish if I want to wear it this summer. It has darts, a zipper and lining — all things I’ve never attempted. It was going along swimmingly until I got to the zipper. Then I couldn’t figure out how to get a nice fit in back without a dress form. Taking it on an off and trying to pin the back while on wasn’t working. So this weekend I asked Regan to wrap me up in duct tape. He was a good sport. Using a combination of these tutorials over at the Threads Magazine site we spent about an hour wrapping me carefully in duct tape. 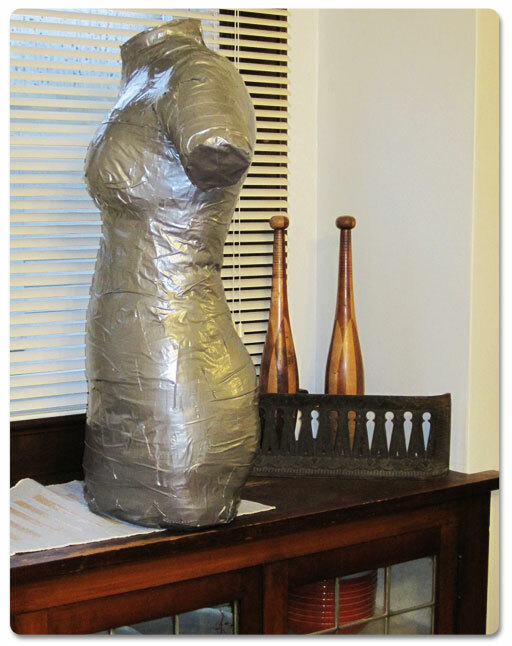 It was a mild success — I now have a dress form that only cost me $6.00 in duct tape even if the measurements aren’t 100% accurate and I lost a pair of underwear in the process. I heard Regan say, “Oops” when he was cutting me out of the “mold” and then felt a breeze. I like to call it my Moon Suit. We’ll see how it works when I attempt to finish my dress. ETA: I would not recommend the duct tape model. It’s only been a day, but our house smells like chemicals and so does the dress I was trying to fit on the model. Maybe it’s just my cheap duct tape or maybe even the “high-end” stuff will slowly kill you. Perhaps attempt #2 using paper mache is in order. If I saw this walking past me in a store — naturally I would be alarmed- but standing up, so life like and in what is obviously your dining room (antique juggling pins a dead-give-away) I knew it was you! But, then again, we share a long history. So, tell me more about the process. Does duct tape hurt coming off? The trick is the t-shirt under the duct tape. And a very patient wrapper, in this case Regan. But I think the real trick is not using duct tape. So sticky. So stinky. The tutorials didn’t warn me of the fumes!